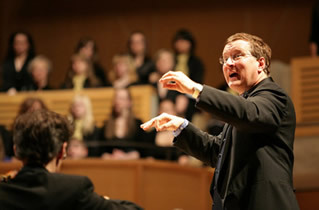 During a spring sabbatical Wes Janzen [pictured left], TWU’s Director of Choral Activities, served as Principal Guest Conductor of the Kiev Symphony Orchestra and Chorus. Third-year forward Jacob Doerksen was named the Canadian Interuniversity Sport men's basketball player of the year during the CIS Awards ceremony in Ottawa on March 12. Doerksen was the first Spartan to claim the Mike Moser memorial trophy since TWU joined the Canada West conference in 1999–2000. Elections of faculty to the new TWU Senate took place in March. Co–chairs: Rick Sutcliffe and Bob Wood. Faculty senators: Paul Chamberlain, Chad Friesen, Sara Pearson, Grant Havers, Archie Spencer. Two representatives from the academic professional staff were to be added by Student Life. During the spring, the TWU Challenge Course was renamed Omada Teambuilding, under the direction of Jamie Barrow. (Omada means “team” in Greek.) Since its inception in 1998, the program had grown considerably, to serve more than 4000 annual participants. After two years of planning, the Langley Events Centre (LEC) [pictured left] opened in a limited capacity on April 16. The LEC was completed by September 2009 and was managed by the School of Human Kinetics on behalf of TWU and the Langley community. 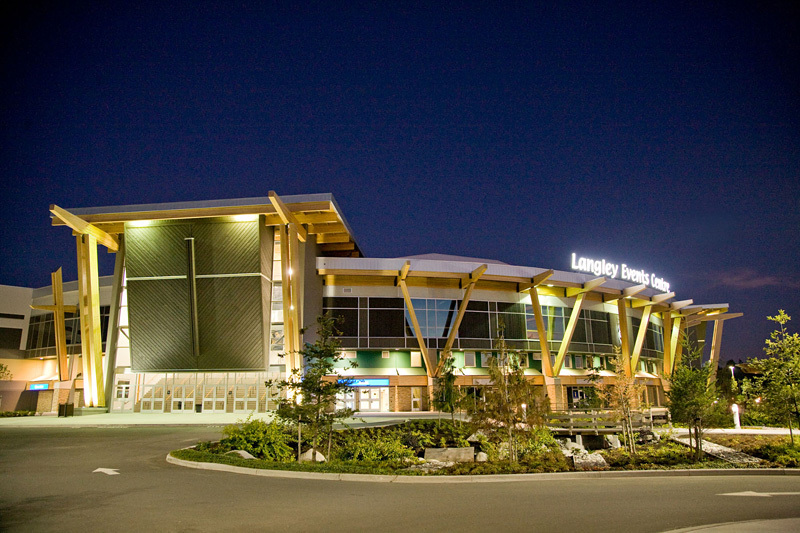 On June 13 the Langley Events Centre hosted a community Open House from 11 am–3 pm. President Jonathan Raymond unfurled the 100th anniversary flags for the centennial celebration of the John R. Booth residence — now the Laurentian Leadership Centre — in Ottawa on May 27. The building, an excellent example of Queen Anne Revival style, was designed by architect John W. H. Watts for Booth, Ottawa's wealthiest lumber baron. On June 17 Rick Hansen spoke to MAL (Master of Leadership) students on Strategic Leadership. In August TWU launched the Master of Science in Nursing (MSN) program, which was the first Canadian faith-based graduate nursing program, and one of just a few predominantly online graduate nursing programs. In early August it was announced that the University would receive over $2.6 million in infrastructure support from the federal government through the Knowledge Infrastructure Program (KIP). The funding was used for an Information and Communications Technology Infrastructure Upgrade, and Neufeld Science Centre Expansion. On August 10 the Laurentian Leadership Centre received $25,000 from Parks Canada for the maintenance of the John R. Booth Residence, a cultural landmark. TWU announced in August that it had recently joined the Royal Society of Canada (RSC), the oldest and most distinguished association of scientists and scholars in the nation. TWU became the 42nd member of the Society, which was founded in 1882, and the first and only private Canadian university to have received an institutional membership. A new Community Covenant Agreement, which superseded the Community Standards document, was introduced on September 2. The new Covenant was published in the online Student Handbook and the Human Resources intranet site. Adult Degree Completion Programs in leadership, social sciences, and psychology were offered through TWU’s main campus, with the first cohort of students to begin in September 2009. TWU first offered Adult Degree Completion programs through its Bellingham, Washington, campus in 2007. Land Dedication service for the new Calvin B. Hanson Chapel was held at 3:30 p.m. on September 20. On October 29 the Mars’ Hill student newspaper [masthead pictured left] took second place for a feature page from 2008-2009 designed by Kayla Gerber, and the Pillar yearbook took second place for its cover designed by Russell Leng, in the College Media Advisors’ Association’s 17th annual “Best of Collegiate Design” competition. Winners were selected from among 1281 entries representing seventy–seven colleges and universities. In November, the Spartans women’s soccer team defeated Queen’s University in Toronto to win the CIS gold medal for the second consecutive year. The Spartans men’s team won the bronze medal in a semi–final match against McGill. The CIS Men’s Soccer Championship was hosted by TWU.